Keynote address: "Movement, Rhythm, and the Primacy of Play! What Nature Wants You to Know About…Play," by Stuart Brown, M.D., founder of the National Institute for Play. Free to all Buffalo State faculty and staff members with Buffalo State ID. Interactive play-based music and movement activities for children ages 3 to 8 and their families (children of other ages are also invited to also attend). Free to all Buffalo State faculty and staff members and the Buffalo community. Family music concert featuring Noise Lab Creative Music Community, a music group from Stanford University that specializes in interactive children’s concerts. 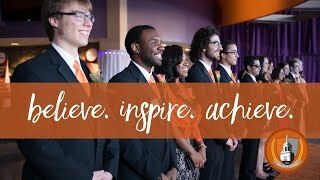 The Buffalo State Day of Play is sponsored by the Buffalo State Grant Allocation Committee, the Academic and Student Affairs offices, the Faculty-Student Association Founders Fund, the School of Arts and Humanities, the School of Education, and the Early Childhood Music and Movement Association. The event is part of the 2018 Early Childhood Music and Movement Association International Convention, being held at Buffalo State June 24–27. For more information about other convention events, please visit the ECMMA Convention website. CTLE hours are available for early childhood educators attending the convention.